DRE have been manufacturing and supplying Motorway Block Grabs for over 20 years. The Motorway Divide Grabs are manufactured in our workshop situated in Bunclody Co.Wexford Ireland, at the Wexford, Carlow and Wicklow borders. DRE have been manufacturing & Supplying divide grabs in Ireland for over 20 years. DRE dividegrabs have been tried and tested in the construction industry. Our divider grabs come in a wide range of sizes and types from a single mechanical to a double hydraulic. 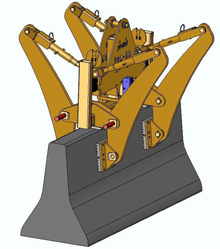 Lifting eye allows for easy hook attachment, self-centers rigging, and will accommodate a fork. Designed and manufactured to ASME B30.20, BTH-1, service class 3.